Discussion in 'Amps and Cabs' started by shood, Apr 23, 2016. I'm in the market for a new cab that will be better at directing sound to my ears than to the backs of my calves. In the constant struggle to balance stage volume with my band mates, I often find that I'm the perfect stage volume for me to hear if I'm sitting down, i.e. my speakers are at ear level, but when I stand up I have trouble hearing myself. I'm looking for a cab solution, not a monitoring solution. The two options that I like currently are 2061 cab clones (e.g. from Stagecraft or Sour Mash) or Metro's new angled 2x12, both of which would angle a speaker (or both) up to where I should be able to hear better. Does anyone have any other cab suggestions that I should explore? Might want to try a semi open-back design. I found a THD 2x12 for cheap on Craigslist and it does the job pretty well. Ever thought about two 1x12 cabs with tilted baffles? I picked these up just before we stopped gigging (my timing is always exceptional). It gets the upper speaker closer than a 2x12, and I could use a 1x12 when needed. A little heavy but you'll hear yourself. Try the Helan Keller model. 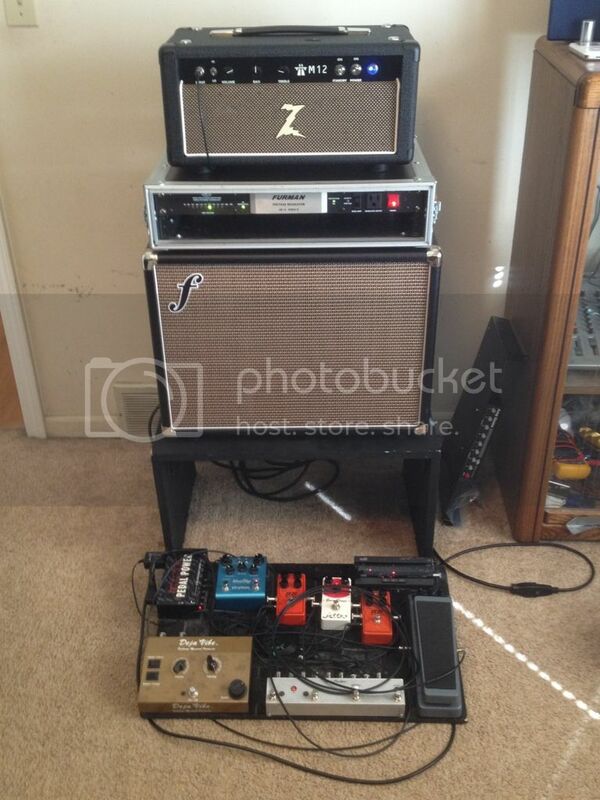 I run a Dr Zbest vertically with the amp wedge to point it up at me. Works well but I am always trying to find a better way without having to lug more **** around. The semi open backs work well and I really like the idea of the Forte cab that has openings in the side of the cab but they are no longer in business. I would like to try the Splawn vertical slant cab, Mesa has one too, used to have one but they are heavy as hell. Open back with celestions, it works so much better than closed back, a sound I like, but don't love. The open back 2x12s I have played are great, fat full with celestion cut, but not so directional it just lost without mics and monitors. Also size is less important than placement, I like my 1x10 just fine when its at ear level. Get the cab off the floor is the standard solution. Monotone Slammins are the answer. Best cabs you can buy now for guitar amps when you have to hear yourself well, but don't want to blast others in the band. Sound techs love them too. Hey, Shood. A vertical stacked 2x12 with the top half angled would solve the problem. I have one I could sell and I don't live too far from you. They still make the Slammins cabs besides the ISO cabs. electricity17 and GuitarsFromMars like this. You don't need a special 2x12. Just use an amp stand or some milk crates. I found some Tupperware step stools that were the perfect height for the various 2x12s I've played over the years. I also built a a stand out of plywood for my 1x12s. Here's an old Fender amp stand I used for many years that gets the cab even higher off the ground. 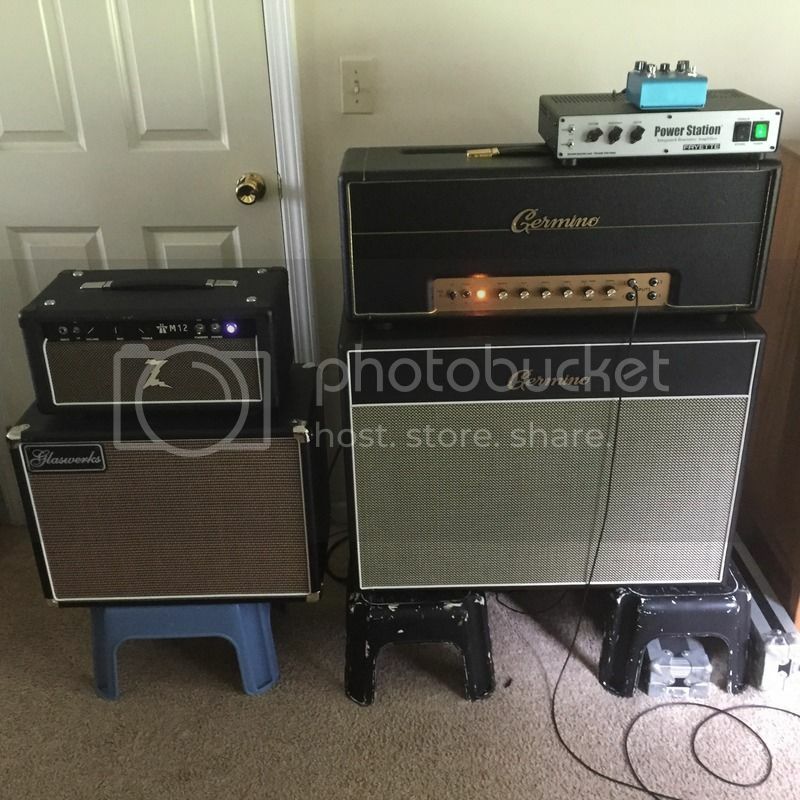 My cab for hundreds of gigs has been a Avatar Contemporary 2x12 with heritage 12-65s that i stack vertically on top of a storage crate that's about 1 foot high. No matter what size stage, I stand so that the top speaker is about even with my shoulder blades so I can hear myself fine and still hear the band. I will be buying a Marshall 2061cx slant 2x12 cab this week and I'm hoping it will replace the Avatar. Not sure if it will be going on the floor or on the crate yet . mojotone make an angled 2x12 cab. That's a pretty ingenious, versatile design: a full iso cab when the cover is installed; regular slanted 2x12 when the cover is off; stereo 1/4" or XLR inputs; pre-mounted goosenecks for stereo mics; and stereo XLR outs to go direct to the board. That would cover a lot of situations. Very impressive! Fender style tilt-back legs on your existing gear? Whoa dude, sitting down while playing? Do you do that while reading music off in iPad mounted to your mic stand while wearing tan pants? I suppose you have a clip on tuner too. Seriously though, why not just put the amp on an amp stand, er, like a normal person. Oh wait, TGP, no one's normal. 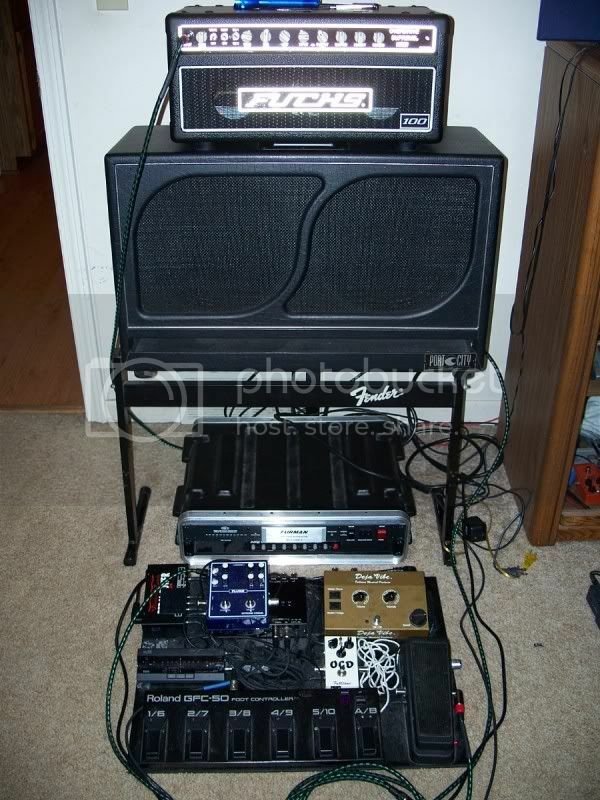 Ok, seriously though, put your amp on an amp stand. No-brainer. If you don't want a whole stand, you got those tilt-back thingies. Or as someone suggested, fender tilt-back legs. Heck, build yourself a little leany-back wooden support for it. Hell, I've leaned amps back against a wall in the past. But for the last I don't know, 20 years I've gigged an amp stand. The Bogner Goldfinger 2x12 is great for this. It really gives you the feeling of a 4x12 from a 2x12. It is definitely on the pricey side though.